How does Funnel handle deleted/archived objects in Facebook? Facebook hides archived and deleted campaigns, ad sets and ads by default, which can result in a perceived mismatch of data between Facebook and Funnel. In order to get all of your data regardless of status, make sure to enable downloading archived/deleted objects when configuring your Facebook source in Funnel. Note that the numbers can be higher in Funnel than in the Facebook Business Explorer. If you don't want to download archived/deleted objects, make sure you look at the data in the Facebook Business Explorer in the same level (i.e. ad level) as the source was connected to in Funnel. Otherwise the total sums may be different if you have archived or deleted objects in your data. Funnel always downloads all objects that are Live. However, Archived and Deleted objects are handled differently by Facebook, and are not returned by default from their API. When connecting your source to Funnel, you can decide if you want to see archived and deleted ads. When looking at your data in the Facebook Business Manager, archived and deleted objects are hidden by default. This replicates the behaviour in Funnel if you have disabled downloading archived and deleted objects. However, the numbers will only match when looking at the same level (i.e. ad level) in the business manager as the level your source in Funnel fetches data. A Facebook data source is connected to Funnel on Ad Level that does not fetch archived/deleted objects. Looking at the statistics with ad breakdown in the Facebook Business Manager, the totals sums should match. Looking at the same data but with campaign breakdown, the total sums will not match the data in Funnel. A Facebook data source is connected to Funnel on Ad Level that does fetch archived/deleted objects. 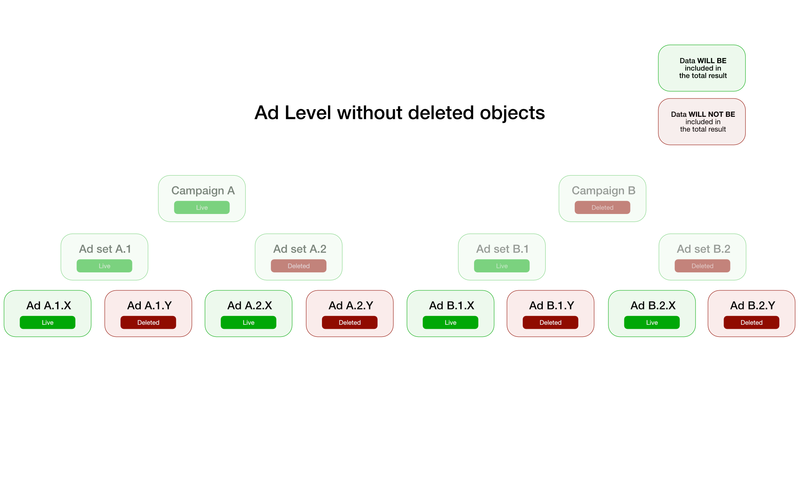 Funnel with fetch all campaigns, ad sets and ads, regardless if they have been archived and deleted. This means that Funnel can have larger total sums than in Facebook, because the Business Manager UI hides deleted objects by default. When not activating the option to download archived/deleted objects, the inclusion/exclusion of archived and deleted objects depends on the level breakdown of the data. 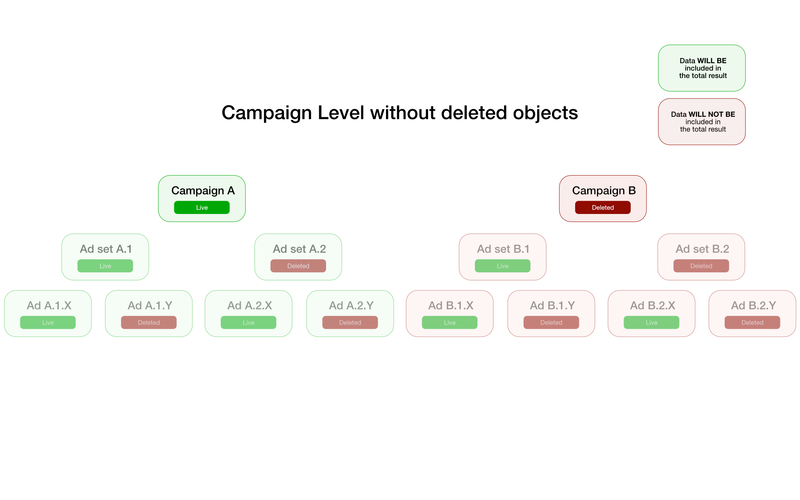 On campaign level, archived/deleted campaigns will be excluded, but all ad sets and ads will be included in the live campaigns regardless of their status. 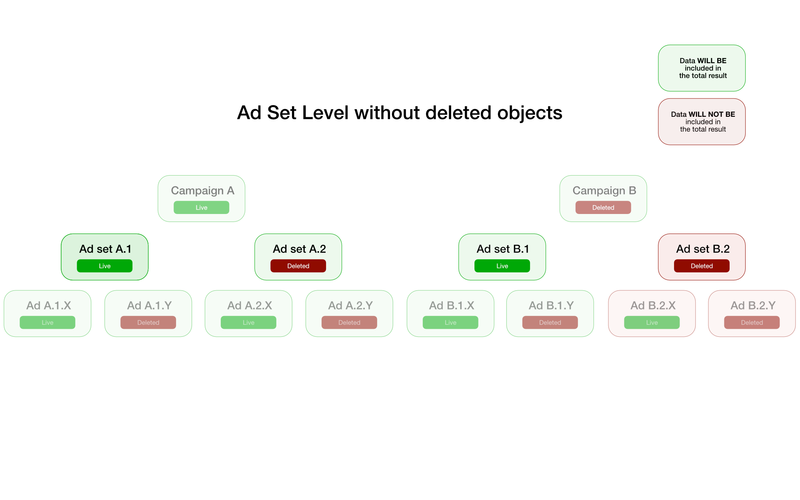 On ad set level, archived/deleted campaigns and ad sets will be excluded, but all ads will be included in the live campaigns and ad sets regardless of status. On ad level, archived/deleted campaigns, ad sets and ads will be excluded, and only campaigns/ad sets/ads that are live will be included. More details can be found in the Facebook API Documentation.